Happy November! Today is just another Friday as I count down to my departure for Peru and Panama, now less than three weeks away. I’m getting pretty excited about those impending additions to my World Karaoke Tour! I still have no idea what songs I’m going to perform in those countries; but I’m confident that my journey will feature some unforgettable nights of singing. Seeing Machu Picchu and the Panama Canal, among other sights, will be pretty awesome too. In this view, you can see the rotating cylindrical cable car that ferries visitors to the summit. (You can also choose to hike up the mountain.) Visible in the background are the smaller peak known as Lion’s Head; and, beyond it, the Atlantic Ocean. Cape Town’s city centre is just to the right of the frame. This photo was taken during my visit to South Africa in September 2011. To see what Table Mountain looks like from ground level, go here. 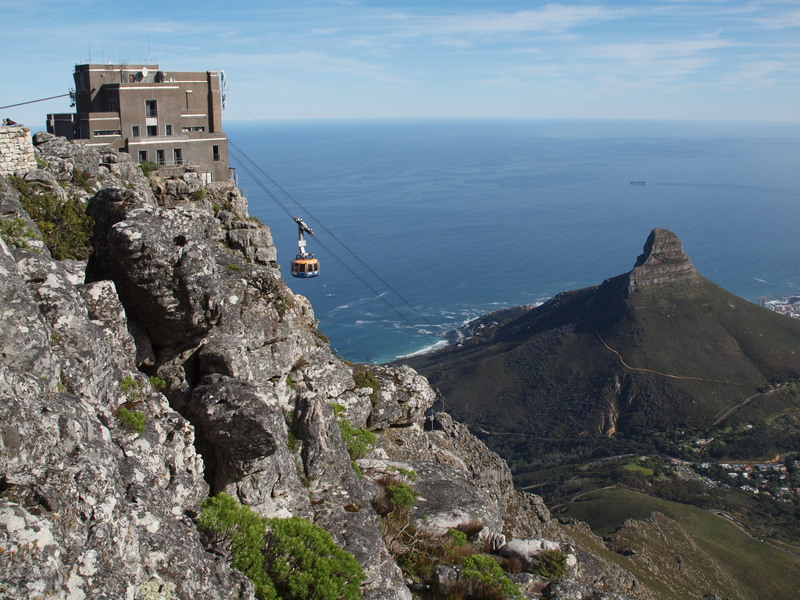 Would you like to go to the top of Table Mountain? Beautiful photo! I loved Cape Town and Table Mountain. @Erin: Thank you! That city is incomparably beautiful, and I very much enjoyed it!